Последний раз редактировалось all-hyips; 24.03.2019 в 12:16. Ассоциация с британской рок-группой сразу возникает. С кошем чуть не угадал админ. 03.24.19 09:47	Account	Receive	+0.42	Received Payment 0.42 USD from account U20821578. Batch: 252393759. Memo: API Payment. 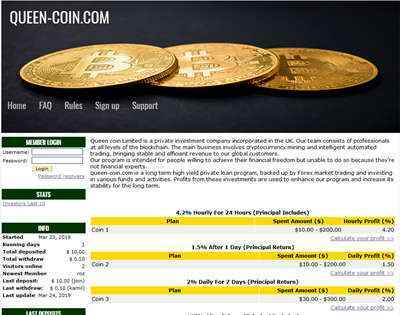 Withdraw from queen-coin.com. Раздел не тот по моему. А что с кошельком не так? То что домен про крипту а принимают только фиат? Ничего там "своего нет". Эта услуга пару баксов стоит. А что с кошельком не так? Да всё так,кош португальский.А компания по легенде британская.Рок-группа тоже оттуда. А планы вообще чушь какая-то, в почасе всего 0,8%, а на четвертый кто зайдет, тут и всё. О переодевании планы не говорят. Процент не плохой на 24 часа. Три рабочих плана. Стата есть. The amount of 4.2 USD has been deposited to your account. Accounts: U20821578->U1... Memo: API Payment. Withdraw to Taneta from queen-coin.com.. Date: 16:11 28.03.19. Batch: 253027847. The amount of 2.52 USD has been deposited to your account. Accounts: U20821578->U1... Memo: API Payment. Withdraw to Taneta from queen-coin.com.. Date: 19:40 28.03.19. Batch: 253051688. The amount of 6.72 USD has been deposited to your account. Accounts: U20821578->U1... Memo: API Payment. Withdraw to Taneta from queen-coin.com.. Date: 03:23 29.03.19. Batch: 253074688. The amount of 10 USD has been withdrawn from your account. Accounts: U1...->U20821578. Memo: Shopping Cart Payment. Deposit to queen-coin.com User Taneta.. Date: 03:25 29.03.19. Batch: 253074781. 29.03.19 04:02 Received Payment 2.00 USD from account U20821578. Batch: 253076942. Memo: API Payment. Withdraw to ruvikrich from queen-coin.com. 29.03.19 05:35 Received Payment 0.84 USD from account U20821578. Batch: 253083299. Memo: API Payment. Withdraw to ruvikrich from queen-coin.com. The amount of 7.56 USD has been deposited to your account. Accounts: U20821578->U1... Memo: API Payment. Withdraw to Taneta from queen-coin.com.. Date: 09:40 29.03.19. Batch: 253110009. 29.03.19 11:03 Received Payment 2.1 USD from account U20821578. Batch: 253118885. Memo: API Payment. Withdraw to ruvikrich from queen-coin.com.